Read the latest news and learn about all the features we've added to iSENSE just for you! Due to an issue with a Google Maps API update, maps were not functioning on iSENSE. This issue has sense been fixed. Due to an issue with a Google Maps API update, maps were not functioning on iSENSE. This issue has sense been fixed. If you continue to see any issues with maps, please use the "report a bug" feature that is at the bottom of every page. If you have any questions, please contact Fred_Martin@uml.edu. iSENSE v4.2 has been released! Click here for more details. This release delivers a highly requested feature (cloning! ), provides users with better zoom control on visualizations, and fixes several bugs and UI issues. Cloning: Have you found an interesting project on iSENSE you'd like to re-create? Cloning makes this easier. Users are now able to clone projects with or without data. The Clone button is above a project's description. 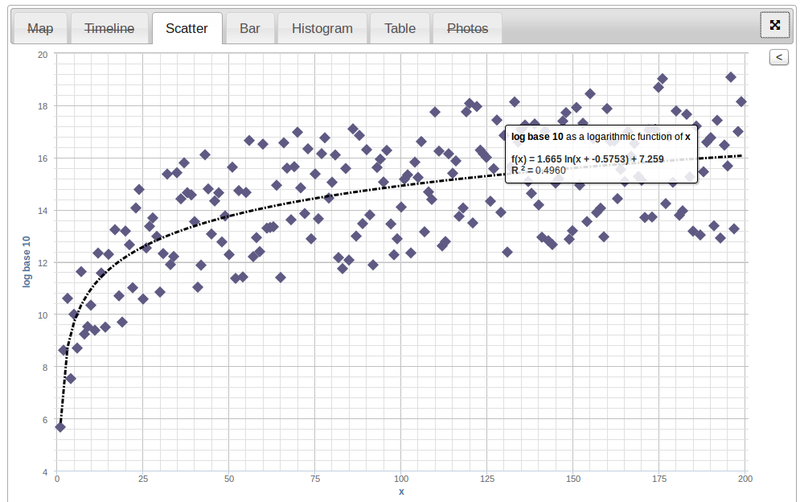 Better Zoom Control on Visualizations: Independent X and Y zoom on visualizations makes it easier to analyze data. The independent X/Y zoom controls can be found on the visualizations tool bar. If you would like to integrate data analysis and visualization into your science, math, or engineering teaching, please come to the iSENSE Teacher Network meeting on 1/23/14. If you would like to integrate data analysis and visualization into your science, math, or engineering teaching, please come to our iSENSE Teacher Network meeting! You will learn about iSENSE, a free web tool for uploading, sharing, and visualizing data. iSENSE is great for making sense of manually and electronically gathered experimental data, statistical data, and geocoded information. meet the technical team and get assistance for your own ideas about how to use iSENSE! We have released a new version of iSENSE with several new features! Contribution Keys: Users without iSENSE accounts can contribute data with a contribution key. A contribution key is like a password created by project owners and distributed to users without accounts who seek to contribute data. Teachers eager to use iSENSE in the classroom without hassling students to create or use iSENSE accounts will find this feature useful. More information regarding contribution keys will be posted in a tutorial. Restrictive text fields: Users can specify a list of predefined choices for text fields. The primary purpose of restrictive texts fields is to make grouping data easier. Users can create restrictive text fields by entering a comma separated list of acceptable text items in the restrictions column when editing fields. Tooltips: Navigating iSENSE just became easier with tooltips. Tooltips are hints users can view by simply hovering over items, such as buttons and search bars, on the website. If you have suggestions for additional tooltips, please let us know. Default visualizations: Project owners can select a default visualization that is best suited to represent project data. New visualization table: The new visualization table loads larger datasets fast, allows you to search per field, and looks clean and polished. User Interface Tweaks: All project options can be found by clicking the Edit button on a project's page. Backend improvements: We are now backed by a testing suite. iSENSE accounts now require a valid email address. If you have not already done so, please update your account with a valid email address. Accounts without emails have automatically been given an email in the form username.fake@example.com. We ask for your email address to help you better manage your account. We talk about changes for version 3.2, and new changes coming ahead. This is primarily a bug fix release. The main change you'll notice is the index pages for browsing projects, visualizations, and tutorials got a facelift. They now should be much harder to break (previously clicking on the search buttons too fast, or resizing the window certain ways caused issues). We have also switched to using pages of results instead of slowly loading everything available, which should make things is a bit snappier. Finially, we now do some validation of data on file upload, so you'll be alerted of things like text showing up in numeric fields. New user account requirements. Emails are going to become required, both for consistency and password reset reasons. Don't worry if you use email-less accounts to contribute data - read on. Data "contribution keys." These are essentially passwords that will allows somone who is or is not logged in to contribute data sets to a project, even if the project is locked. We hope that this will allow more control over projects and contributions, which many of you have been asking for. This also allows non-users to contribute data (such as in a classroom environment). No need for email-less accounts anymore. If a non-user contributes a data set, it will be owned by the project owner. Project field restrictions. When creating a project, you will be able to restrict what values can go in a text field by specifying a comma-separated list of accepted values. This should help keep erroneous values out of text fields intended as specific labels, such as poll results or hurricane classifications. We have released a new version, including regression tools! Regressions: We now have regression tools for timeline and scatter! Supported types are: Linear, Quadratic, Cubic, Logarithmic, and Exponential. These are available in a new toolbox within those visualization types. Keep in mind they are still a bit experimental, so please let us know if you find any problems. Tweaks to Heatmap Weighting: Now if you select a field other than 'Marker Density' in the heatmap, its weight is skewed much more heavily towards the values present in an area, rather than the density of points. The result in general has been more meaningful heatmaps in our experience. Templates: We have put in a new template system for writing content blocks. Right now there is just one for a basic project, but in the future we will be expanding these with more templates for projects, and other content blocks (like saved visualization, data sets, etc...). Under the Hood: We have been continuing to fix the various bugs that have popped up after the switch to 3.0. A notable switch here is the edit button for content blocks is back, allowing users to click their own links again (sorry about that!). We have released a new version, check out this article for details! New Look and Feel: We have updated the look and feel of most portions of the website. This includes removing a lot of those annoying pop-up windows in favor of new pages (some are still around), especially in the data upload process. The field edit process also has its own page now, and should feel much less claustrophobic. New formats supported for file uploads: We now support upload from gpx, xls, xlsx and ods, as well csv files separated by tabs and semicolons. Currently we only support tracks in gpx files, specifically. Under the hood: There's been a lot of changes under the hood that should make things go smoother in general. This includes a number of bug fixes and interface tweaks. We have released a new version of iSENSE! Improvements to Map vis and more! Rework of heatmap for the map visualization: Now heatmap uses a radius of meters instead of pixels, so when you zoom in on the map you also zoom in on the heatmap. Unfortunately, limitation forced us to limit the maximum on-screen radius of the map, but the visualization will warn you when this happens, and inform you what the actual radius is you're looking at. Time lines for the map visualization: Now you have the option to connect points within the same group with a line on the map. The order of this line is based on timestamps, so its only available if your data contains both location and a timstamp. New timestamp parser: The timestamp format has been reworked a bit to include support for the ISO 8601 format (used by many devices). We support all parts of the date and time format, except we require a full date. The technically minded can check out the specification here http://en.wikipedia.org/wiki/ISO_8601. Don't worry, we still support all the flexibilty we did previous as well, such as specifying months with three letters, and AM/PM notation. Dataset titles are now unique in each project: This means no more projects with several "Dataset #1's, but it might also mean you have to change a name if you upload at the same time as someone else, so don't be alarmed! New symbol order: We have reordered the symbols you get for the scatter and timeline visualizations (the old order will still be there for saved visualizations). Hopefully the new order is more readable, and we will continue to work on things like this as time goes on. Password and email management: Now you can change both your password and email address by pressing the link on your user page. You can also request a password reset if you have given us an email and you forget your password. Locking projects: Ever get a project into a good state and want to preserve it for viewing? well, now you can lock your project from the project dropdown menu, preventing anyone else adding or editing datasets. Curated projects: This is a new flag that we will be putting on projects containing professionally gathered (or otherwise 'clean') datasets. For now you can search for these on the project page once we start using it, but be on the lookout for some changes to the home page in the future. Lots of other bug fixes and interface tweaks. This post contains a link to the workshop slides. Come to UMass Lowell for a hands-on workshop, 9a to 1p, Sat Oct 19. Are you a K-12+ Educator? Are you interested in bringing inspirational, hands-on technology experiences to your classroom to enhance student learning of science, technology, engineering and math (STEM)? If so, you are invited to a free hands-on workshop for K-12+ Educators to learn about building robots and how to include them in your teaching at UMass Lowell. We'll also have a science module on data collection and visualization. The workshop will be held at UMass Lowell, in Olsen Hall on Saturday, October 19, 2013 from 9am-1pm, with registration/refreshments starting at 8:30am. * Interact with other teachers who have already used robots. * Build and program your own robot creature. * Receive advanced instruction for experienced users. * Receive information about funding opportunities! Please note: this workshop is open to K-12+ educators only. Please register ASAP or by October 13, 2013 at robotics-science-uml.eventbrite.com! 9/6/13 | Welcome to iSENSE! iSENSE is a collaborative data collection and visualization tool. It was designed and built at the University of Massachusetts, Lowell, under Cyber-learning grants from the NSF.